For a workout in the comfort of your own home, Lonan O’Herlihy has unveiled his latest HIIT workout using household items as handy equipment including Sony’s new speaker as a portable weight. With its combination of bassy sound and portability, it compliments his workout blend of speed, endurance and strength. The workout makes full use of the product’s key features, including; handle for easy use, EXTRA BASS™ sounds and line lights to bring the beat to life and keep the pace going, durability which means he can incorporate it into any exercise, splash proof capabilities and the Google Assistant feature which allows him to switch up the playlist with his voice – leaving him to continue the workout. Keep your HIIT to a maximum of 30-minutes, after that you’ll start to lose your form leaving you prone to injury. Pick the right kit for you – the joys of HIIT are that you can work out your intensity, so don’t worry about investing in all the kit right away. Always warm up and cool down for at least five minutes before and after your HIIT workouts. It’s important to not just stop after HIIT as that can leave you feeling lightheaded, so cool down gently afterwards. Keep the intensity high throughout - Music is a great way to keep your energy levels up and give you a beat to work to, pick bassy music for the best results and turn it up! Make it fun! 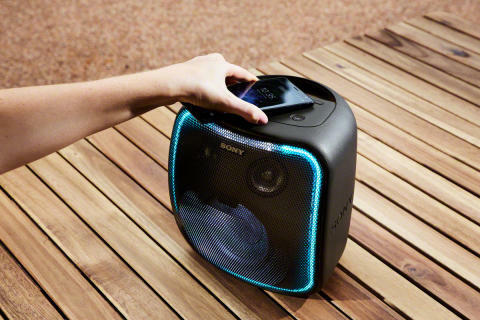 The Sony XB501G speaker also has line lights which flash in time with the music, making it even easier, and more fun, to stick to the beat and work through your session. The SRS-XB501G portable party speaker comes in black or blue, is priced at approximately £300 and is available now.